Luis Barrera does not have any MLB stats for the season. Luis Rafael Barrera (Herrera) was originally signed by A's scout Raymond Abreu. Began the year at Single-A Stockton where he hit .284 in 88 games…was promoted to Double-A Midland July 15 and batted .328 in 36 games with the RockHounds…combined for a .297 batting average, 26 doubles, 11 triples, three home runs, 64 RBI and 23 stolen bases in 124 games…tied for seventh in all of minor league baseball in triples…had career highs in games, at bats, runs (75), hits (132), doubles, triples, extra base hits (40), RBI, hit by pitches (5), walks (41) and stolen bases…ranked second in the A's farm system in triples, third in batting, fourth in runs, fifth in stolen bases, seventh in RBI, eighth in hits and ninth in extra base hits…hit .298 (102-for-342) against right-handed pitching compared to .294 (30-for-102) against left-handers…slugged all three of his home runs and had 37 of his 40 extra base hits against righties for a .453 slugging percentage (.333 vs. lefties)…batted .387 with runners in scoring position, including .418 with RISP and two outs…was 6-for-14 (.429) with 15 RBI with the bases loaded…hit .206 in April but then batted .297 or better in each of the remaining four months (.316 in May, .297 in June, .313 in July and .328 in August)…batted .320 with all three of his home runs at home with Stockton… hit .313 at night, .214 during the day…had a .500 batting average in the first inning…appeared in 61 games in center field, 43 in right field, 15 in left field and one at first base…committed four errors as an outfielder for a .986 fielding percentage…had 12 outfield assists, including 11 with Stockton, which tied for third in the California League…hit in every spot in the order except third and fourth but saw his most playing time with 46 games batting seventh and 31 hitting eighth… played for Mesa in the Arizona Fall League following the season and hit .263 with 12 RBI and six stolen bases in 15 games…named to the East squad for the AFL Rising Stars Game…also played for Licey in the Dominican Winter League and went 11-for-25 (.440) with four walks (.500 onbase percentage) in 17 games. MINORS: Began the year at Single-A Stockton and hit .111 over his first 12 games…drove in a season-high four runs April 9 against Rancho Cucamonga…also had four RBI April 28 at Lake Elsinore and then drove in three runs the next day against the Storm…was batting .141 through April 26 before hitting safely in seven consecutive games (12-for-27, .444) to boost his average to .250 on May 3…had a season-high in hits May 24 at Rancho Cucamonga when he went 4-for-5… had a season-best 11-game hitting streak from June 26 to July 6…went 17-for-42 (.405) with 13 runs scored and six multiple hit games during the streak, which boosted his average to .292… that was the highest it would reach at Stockton…then went 7-for-32 (.219) over his final eight games with the Ports to finish at .284…was tied for second in the CL in triples (7) at the time of his promotion to Midland on July 15 and ranked seventh in runs (51)…his .328 batting average with the RockHounds was second best in the Texas League from July 15 through the end of the season…also ranked first in triples (4), tied for fifth in steals (13) and seventh in on-base percentage (.378)…went 3-for-14 (.214) over his first four contests…then reached base safely in 20 consecutive games from July 20 to Aug. 11…had a .361 batting average and .425 on-base percentage during the streak…stole a season-high three bases Aug. 3 against San Antonio, his third multiple-steal game of the season…it gave him 11 steals over his first nine games with the RockHounds…was batting .330 at Midland when he was placed on the disabled list Aug. 23 with a lacerated finger on his right hand…was reinstated Aug. 30 and went 5-for-16 (.313) with five RBI over his final four games. April 1, 2019 CF Luis Barrera assigned to Midland RockHounds from Las Vegas Aviators. 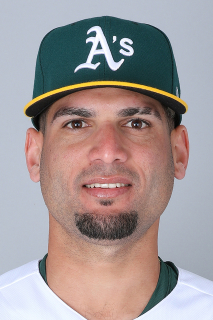 March 3, 2019 Oakland Athletics optioned CF Luis Barrera to Las Vegas Aviators. December 27, 2018 Tigres del Licey placed OF Luis Barrera on the reserve list. November 20, 2018 Oakland Athletics selected the contract of CF Luis Barrera from Midland RockHounds. November 20, 2018 OF Luis Barrera assigned to Tigres del Licey. August 30, 2018 Midland RockHounds activated CF Luis Barrera from the 7-day disabled list. August 27, 2018 Midland RockHounds placed CF Luis Barrera on the 7-day disabled list. July 15, 2018 CF Luis Barrera assigned to Midland RockHounds from Stockton Ports. April 2, 2018 RF Luis Barrera assigned to Stockton Ports from Beloit Snappers. January 8, 2018 OF Luis Barrera assigned to Tigres del Licey. September 6, 2017 LF Luis Barrera assigned to Beloit Snappers from Stockton Ports. July 12, 2017 LF Luis Barrera assigned to Stockton Ports from Beloit Snappers. May 9, 2017 Beloit Snappers activated LF Luis Barrera from the 7-day disabled list. April 26, 2017 Beloit Snappers placed LF Luis Barrera on the 7-day disabled list. August 5, 2016 LF Luis Barrera assigned to Beloit Snappers from Vermont Lake Monsters. June 15, 2016 LF Luis Barrera assigned to Vermont Lake Monsters from AZL Athletics. May 19, 2015 LF Luis Barrera assigned to AZL Athletics from DSL Athletics. July 3, 2012 Oakland Athletics signed free agent LF Luis Barrera to a minor league contract.